Some people also refer to this as your artist’s voice, much like every singer has a distinct tone that cannot be duplicated, or a signature style that’s immediately recognizable (think Georgia O’Keefe or Frida Kahlo). It is what sets you apart from the pack of ordinary work, where a dozen pair portraits from a dozen different artists could be lined up next to each other and all look as if they came from the same artist. When your work is speaking from the level of your soul, no one can ever successfully copy you. Your artistic fingerprint is just that: yours. By definition it cannot be anyone else’s. Only a lot of artists feel confused by the difference between loving what they have just made, and knowing the work carries a distinct sense of who they are as an artist. An artistic fingerprint can be simple or complex, but it is never about self-duplication. organically, probably effortlessly, and it infuses your work with what I call the soul essence of self. If it’s organic, effortless, and my soul essence, why can it seem so hard sometimes? Thing is this: artists are super-charged creative beings. This is not some theory, i.e., everyone is creative; this is creativity manifesting in time and space, visible to all. And one of the key attributes of creativity is that it is not domain specific. In other words, when you are creative, you are creative across multiple venues. Some writers also paint. Some musicians also sculpt. Some painters also dance. Some painters sculpt, write, dance, play music, etc. Some sculptors can’t stick to clay, but forage into 3D collage, or wood, or stone, or…. And this is where the challenge begins. When you are creative, you naturally open the flow to many ideas with many inspirations taking you off on many directions. And, oh the joy! of that expression—the creative flow that carries us on timeless wings into worlds beyond our daily existence. Who has any inclination to consider whether or not an “artistic fingerprint” prevails? It’s all coming up roses! And yet, why do the work you do if it’s not indelibly yours? I don’t mean to imply that creating works of art for the sheer pleasure of it is a problem. It’s not—at it’s core this is all about pleasure. But if you plan to make an impact with your work, if that is important to you, then an artistic fingerprint is essential. Only I want to make a distinction between work that ends up in the world, and work that is being made on your way to work that ends up in the world. Practice makes perfect. It can also make storage a problem. One of the biggest mistakes I see artists make is confusing the work they are “practicing” on with the work they put out for buyers and collectors. The problem originates with the physicality of what artists do. A pianist practicing for a symphony concert doesn’t have this problem. The notes disappear into the air. A canvass takes up space even as it reminds us of how we felt doing the work. So the discipline of the artist becomes far more problematical, and especially if you fall in love with every piece you do. Practice work and work ready for your public is not the same, and your maturity and sophistication as an artist depends on you acknowledging the difference. That’s step one. Step two is knowing your artistic fingerprint, knowing and naming the characteristics so you can infuse conscious intentionality into what you are doing. Imagine that you are in a group show with 10 artists. All ten of you have 4 pieces sprinkled in-between each other, and spread over three rooms. Could a stranger see one piece in one room, than another piece in a different room and immediately know these pieces were yours? And not because they were all cats! (or cheese and wine, or landscapes). But because your artistic fingerprint is unmistakable. One of the big roadblocks artists will often put in their path is this fear that someone or something is going to try to control their creative expression. Often, this is a fear that signals a need for expanded emotional awareness. First off, no one can control you unless you give them permission. Second, creativity thrives on both challenges and working within narrow boundaries (can’t go wide, go deep!). One artist I know limits her color pallet to 3 colors for any piece she works on. And recently she was rewarded with a huge museum show where her career shot off the charts! Believe me, when you see Shirley Williams’ work, there is no question that it is hers. 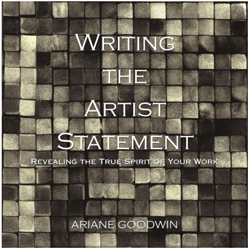 When you do the work of writing an artist statement, it can open you up to aspects of your work that you were unaware of, or just hadn’t noticed yet. 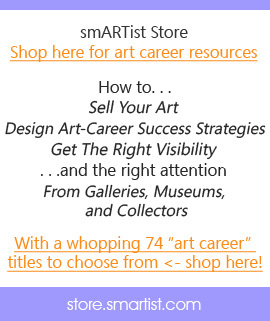 It’s a good start if you are struggling with your artistic fingerprint, to get a handle on your artist statement. Not just to end up with an artist statement, but to expand your relationship to your work so you can be aware at another level. Loved this post, Ariane! Thanks so much…..I feel that there’s a delicate balance between letting the creativity flow and having a distinct look to my work. Your words help to clarify this. You are so right about this, Ariane! It is really important too find that voice and to nurture it. I think that I’ve finally come to a point where my work is indelibly my own, but there was plenty of pieces in the past that should have just been left in the studio as “practice” work. And thank you for sharing Shirley’s website, her work is fantastic! into a juried show, found me and said, “I knew that was yours the minute I walked in the door.” Being a successful collage artist, she proceeded to inform me that I needed to use the prize money to buy some good paper and glue! Which speaks to your point about the play, the practice and the product to sell. I’m glad I entered the work but I never put it for sale.